What’s a reasonable commute? An hour? Maybe two? What if, on some days, you spent more time getting to and from work than you did at your office doing your job? This is the daily grind for hundreds of thousands of workers who spend on average six hours – and sometimes up to nine – commuting to and from Beijing, according to a recent BBC report. 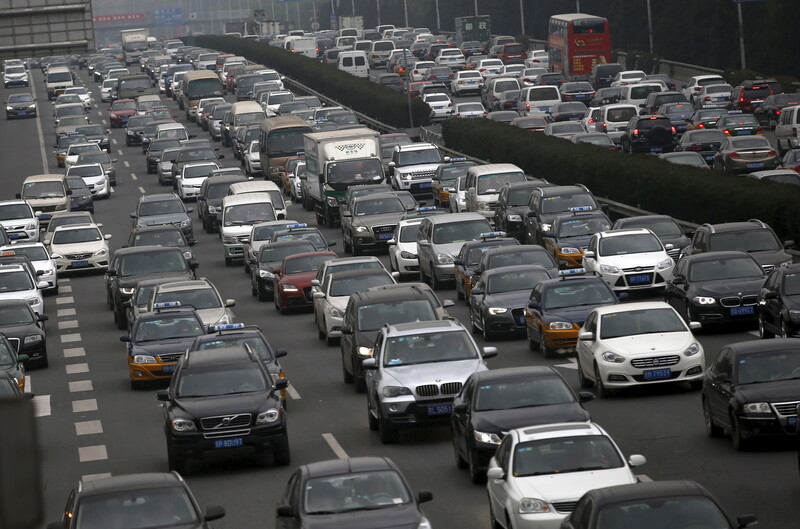 Beijing residents spend on average 52 minutes commuting . Many workers, however, have been priced out of the capital’s sky-rocketing property market. They live instead in more affordable satellite towns and cities, such as Yanjiao, in Hebei province, which is around 35 kilometers from the capital. Known as ‘sleeper’ cities; they’re a place for weary commuters to lay their heads. Traffic jams stretching for many kilometers are already a familiar sight in Beijing, and other Chinese cities. In an effort to avoid the gridlock, some commuters have given up using their cars. Some have turned to a hand-pulled ferry to help them get to work faster , while others have elderly relatives rise at the crack of dawn to queue for them at bus stops, where the wait to get on can be over an hour. In the US meanwhile, commutes have been getting steadily longer . The average American daily commute was about 24 seconds longer in 2015 than 2014. Over the year, this added about three hours and 20 minutes to the total time spent getting to and from work. In the UK, a two-hour commute is a daily reality for 3.7 million workers – a figure that has increased by a third in five years. In recent years, a growing number of people have been travelling even further to work. Known as “super commuters”, they cross borders or cover very long distances. These commuters often work from home part of the time, and make the journey once or twice a week, or less. They take advantage of lower-cost housing where they live and higher salaries where they work. The growth of broadband internet access, the development of home-based computer systems that rival those of the workplace, and the rise of mobile communications systems have contributed to the emergence of the super-commuter in the United States, according to a report by the New York University Wagner School of Public Service. In Europe, almost 1.7 million residents from Schengen Area countries crossed the border to go to work in 2014 . The share of cross-border commuters is particularly high in Slovakia (5.7%), Estonia (3.5%), Hungary (2.4%) and Belgium (2.3%). The rise of low-cost airlines in Europe has also contributed to the growth of the super commuter. The ups and downs of commuting Longer commutes are linked to increased rates of obesity , high cholesterol , high blood pressure , back and neck pain , divorce , depression and even death . They also make us fatter , adding an average of more than 700 calories to people’s diets each week, according to one British study. But there are upsides too. People report having the time to fall in love with reading again , and using it to further their education . In the future, technology may well make long commutes a thing of the past. The Hyperloop is an all-electric, direct high-speed connection that could shrink two-hour commutes to 30 minutes.